This is an advertisement for Carlifornian Borax, an antiseptic used in the late 19th century. Joseph Lister, a surgeon operating in the mid 19th century realised that antiseptics were essential for keeping wounds germ free. He publicised his successful use of antiseptics and soon it was realised that they were useful not only in medicine but in daily life. 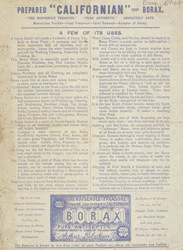 This leaflet advertises the use of Californian Borax to purify water, this would have been very important to those living in the late 19th century because they had witnessed the deaths from cholera caused by contaminated water supplies.